Mix all ingredients except tortillas. 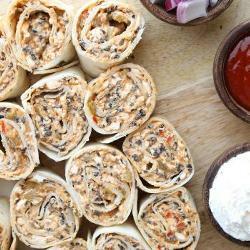 Divide mixture evenly among tortillas, spread slightly and roll up. Refrigerate 1-2 hours and cut into 1-inch slices. Can be served with sour cream if desired.